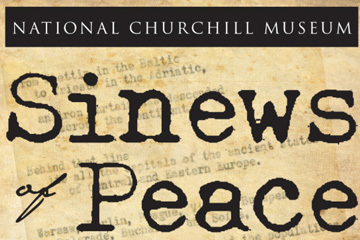 This ongoing exhibition focuses on Winston Churchill’s mastery of language and how the words in his “Sinews of Peace” speech changed the course of history. Widely known as the ‘Iron Curtain’ speech, Churchill’s address on March 5, 1946 at Westminster College in Fulton, Missouri warned the world of the looming threat of the Soviet Union in Europe. The National Churchill Museum will display a typewritten draft of the speech with handwritten corrections dictated by Churchill to his secretary Edith Nina “Jo” Sturdee. All fifty pages of the speech will be displayed allowing viewers to experience first-hand Churchill’s final edits to his most famous post-war speech. The exhibition also includes photographs, rare audio and video clips, and never-before exhibited documents, including correspondence between President Harry Truman, Winston Churchill, and Westminster College President Franc McCluer. The exhibition is made possible, in part, by the Sandra L. and Monroe E. Trout Endowment at Westminster College.